Stretch marks – how can microdermabrasion help? This is a before and after picture from one of our incredibly talented SkinBase microdermabrasion therapist, Leila Paris. It’s just one example of how effective microdermabrasion can be on stretch marks. So often, we focus on the benefits SkinBase microdermabrasion can have on acne and acne scarring, dull and tired skin and pigmentation and ageing skin that we forget to tell you about how fantastic the treatment can be on other pesky skin problems – stretch marks included! Weight loss, weight gain, pregnancy or simply growing can all result in the fine silvery, long, fragmented scars that are sunken into the skin – despite being extremely common, it can be unsightly, and often make you feel self-conscious about wearing certain clothing or getting into your cozzie at the beach. So, how exactly does microdermabrasion help target stretch marks? Well first it’s important to understand how much elasticity plays in how stretch marks form, and is also an important factor in how we can use microdermabrasion to remove stretch marks. 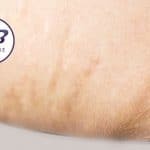 Stretch marks form because a certain hormone becomes overactive and stops the skin from producing collagen and elastin fibres responsible for keeping growing skin taut – SkinBase microdermabrasion targets the problem area and through the fine crystals stimulates elastin and collagen, getting rid of stretch marks. Over a course of SkinBase treatments, the skin surrounding the stretch marks is brought down to a level closer to the stretch mark itself. Although the marks are still there, the SkinBase™ treatment helps to blend the stretch marks with the surrounding area so they become significantly less visible. Try it yourself and book a course of SkinBase treatments, here.